Pazham pori aka Ethakka appam or banana (Kerala Plantain) fritters is a traditional evening snack item in Kerala. Its available throughout Kerala and all most all Keralites prepares it the same way. Its simply ripe banana’s coated with flour and deep fried in oil. Mix the all purpose flour, sugar, baking powder, salt and water in a dish and blend it thoroughly to form a semi thick batter. Add a pinch of turmeric powder to the batter to color a bit. Peel the bananas and slice them length wise into half and then slice each halfway into 3 or more to get the thin slices. Dip the slices in batter and evenly coat them. In a deep bottom frying pan heat some oil. When the oil becomes hot, dip the batter coated banana pieces and fry them until they become golden brown. Flip them in between. Remove from oil and drain the excess oil with paper napkins / kitchen towel. Its better to use the Kerala plantains (nendra pazham) for the preparation. Some people add a little of crushed cumin seeds (ജീരകം) to the batter. You can add it if you want. Its better to serve it when the snack is still hot. We have other banana recipes also. Try them. 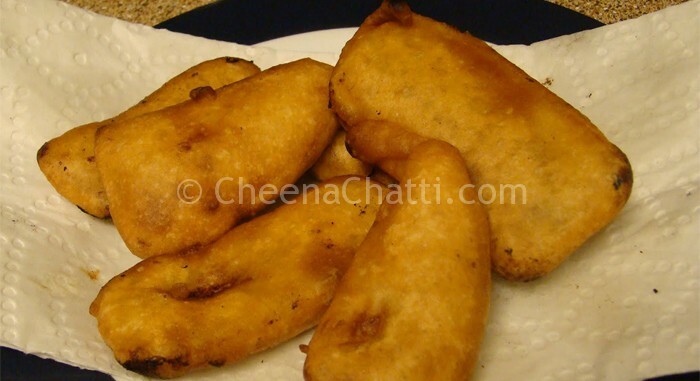 This entry was added on May 9th, 2013 by Jameela Beevi in Desserts and tagged with nadan palaharam, crispy pazham pori recipe, pazham pori with wheat flour, banana fry, kerala banana fry, easy pazham pori recipe, pazham pori kerala, evening snack, banana. Last revised on March 31st, 2018. Recipe & Recipe photo contributed by Saumya S.
My favourite snack..my sister too loves it a lot.